When I was going to the University of Utah I worked at The Lion House. For you out of state-rs, its a wedding reception/banquet dinner kind of joint. They have the most FABULOUS bakery. Fabulous for the pallet, not so fabulous for the hips…if you get my drift. The dinner rolls there are pretty much to die for. 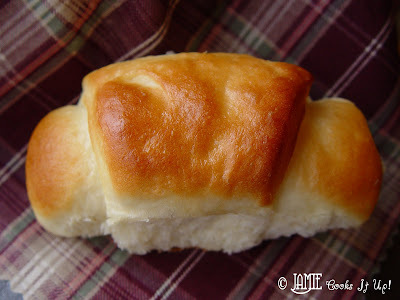 This crescent roll recipe is my closest adaptation to The Lion House rolls. I have tried their exact recipe a lot of times, and it just doesn’t turn out the same. So over the years I have adapted the original recipe until it has turned out so divinely delicious I can never eat just one. Hence, the reason I only make them for holidays, and special occasions. This recipe makes 48 good sized crescent shaped rolls. Making them crescent shaped really adds a nice texture. Lion House Honey Butter is a must for these beauties. The two are a lovely combination. Happy Baking! 1. Place the warm water, yeast and dash of sugar in the bottom of your mixer. Stir it around and let it sit for 5 minutes. It should start to rise and get all bubbly. 2. Add 3 cups of the flour and mix for 30 seconds. You want to add this much flour, before you add the scalded milk and eggs…the hot temperature of the milk would be too much for the yeast, and you don’t want to “cook” your eggs. 3. Add the scalded milk, sugar, salt, softened butter (not the melted butter) and the eggs. Mix for 1 minute. 4. Add the flour 1 C at a time, until the dough scrapes the side of your mixer clean. 5. Mix on high for 8 minutes. This much mixing really improves the texture and elasticity of the dough. I have also noticed, if I don’t mix it long enough the dough doesn’t rise as nicely. 6. Let the dough rise, in the mixer for about 45 minutes, or until doubled in size. 7. Punch the dough down (I just turn the mixer on for about 5 seconds) and divide it into 6 equal parts. Shape each part into a nice round ball and let them rest on the counter top. I always spread a little of the melted butter on the counter top, before I set the dough on it. Let the dough rest for 5 minutes. Letting dough rest for just a bit before it’s shaped makes a HUGE difference when you are trying to shape it. Let’s just say it cooperates better. 8. With a rolling pin, roll each ball into a nice round circle. You want the dough to be about 1/2-3/4 of an inch thick after rolling it out. Pour a bit of butter in the center….I said it was no dieters delight…you see now what I mean. 9. With a pizza cutter, cut the circle into 8 equal triangles. Start from the fat end and roll each triangle up. Place on a large, sprayed cookie sheet. 10. It works best to place them in 3 rows, 8 rolls deep. They like to be about this close together. 11. Place them in a warm 170 degree oven, and let them rise for about 20 minutes. Don’t let them get too tall. Once they start to touch each other, they have risen enough. I have a convection oven, so I can cook both pans at the same time. If yours is a conventional oven (this means it does not have a fan in the back), you will definitely want to cook one pan at a time. Just set one pan on the counter to rise. It will rise more slowly than the pan in the oven, but it will be just the right amount of time to get the other pan cooked and your oven empty and ready for the second pan. 12. Turn your oven up to 350. Leave the rolls in while the oven increases in temperature. (I have had people tell me who own gas ovens that they are better off taking the pans out of the oven while the temp. rises) Bake for about 15 minutes. After about 7 minutes (or when the top pan has gotten a bit golden on the top) I switch the bottom pan to the top, and the top to the bottom. 13. When the rolls are still hot, I brush them all over with more of the melted butter. Delightful! Happy Holiday baking! NOTE: For those of you attempting this recipe with out a mixer, my hats are off to you! You are home cooking wizard of the century. I also have a few tips. 1- You won't need quite as much flour. 2-You will want to let the dough rise in the bowl 2 times. Punch it down after the first rising period, then let it rise again. Punch it down a second time and you are ready to move ahead with shaping and baking. Thanks to my lovely sisters Erin and Cynthia for these tips...they have been braving this recipe with no mixer. They are deemed home cooking wizards of the century! 2. Add 3 cups of the flour and mix for 30 seconds. You want to add this much flour, before you add the scalded milk and eggs...the hot temperature of the milk would be too much for the yeast, and you don't want to "cook" your eggs. 5. Mix on high for 8 minutes. This much mixing really improves the texture and elasticity of the dough. I have also noticed, if I don't mix it long enough the dough doesn't rise as nicely. 7. Punch the dough down (I just turn the mixer on for about 5 seconds) and divide it into 6 equal parts. Shape each part into a nice round ball and let them rest on the counter top. I always spread a little of the melted butter on the counter top, before I set the dough on it. Let the dough rest for 5 minutes. Letting dough rest for just a bit before it's shaped makes a HUGE difference when you are trying to shape it. Let's just say it cooperates better. 8. With a rolling pin, roll each ball into a nice round circle. You want the dough to be about 1/2-3/4 of an inch thick after rolling it out. Pour a bit of butter in the center....I said it was no dieters delight...you see now what I mean. 11. Place them in a warm 170 degree oven, and let them rise for about 20 minutes. Don't let them get too tall. Once they start to touch each other, they have risen enough. I have a convection oven, so I can cook both pans at the same time. If yours is a conventional oven (this means it does not have a fan in the back), you will definitely want to cook one pan at a time. Just set one pan on the counter to rise. It will rise more slowly than the pan in the oven, but it will be just the right amount of time to get the other pan cooked and your oven empty and ready for the second pan. Ive always been scared of cooking from scratch… id see the ingredient YEAST and run for the hills. This Easter I faced my fears and made hot cross buns… they came out pretty decent..but your crecenst rolls look much more yummy! Hooray for convection ovens ~ These rolls are to die for! I didn't know you used to work at the Lion House!! My wedding dinner was there. Their food is superb. I'm so glad to hear it from an expert that the standard “Lion House Roll” recipe isn't as good as theirs. I've been fairly successful, but never completely satisfied with that recipe. I can't wait to try this one with my new convection ovens! Those look fabulous- I'm gonna try 'em ASAP! love the blog! we have 5 children and would like more, so rednaig your blog is like a peek into what the future could be like! I’m wondering if you used molds to get those great shapes from the salt dough? and if so, WHERE did you find them? I’ve never seen any shaped like race cars or dinosaurs, just pretty ones for making candy.thanks! Well, what can I said? I hope you can still doing this amazing job. Unfortunately I don't have enough time to come across the blog and read each post that you done. You mean 10 to 12 CUPS???? Yes 10-12 C means 10 to 12 Cups. You will add the flour one cup at a time until you reach the desired constistancy. These are really delicious and so easy to make. I halved the recipe with excellent results. Made half into crescents and half into cinnamon buns. Wow! I also made your Snickerdoodle cake and french bread and we loved them both. Thanks so much for sharing your great recipes. Thanks for your reply! Now another question, when you say yeast, do you mean Active Dry Yeast or Instant Yeast? I always use Active Dry yeast. Hope they turn out great! Thanks for your question. Oh my goodness, I love the Lion House rolls! Can't wait to try these! Do you happen to know how to make the tuna sandwiches the Lion House makes for birthday parties? I still dream about those… 12 years later. I totally remember the”ribbon” sandwiches you are referring to. I know they ordered the bread from a bakery that would slice the loaves from end to end and through the middle. Then each slice was buttered on both sides, filled with the tuna/mayo mixture and I'm pretty sure they sprinkled paprika on the top. It's funny how many kids loved those! Made these today and they are PERFECTION! Hi Jamie! I need about 60 rolls so I plan to make 1 – 1/2 batch of these delicious rolls. Is it necessary for me to add The extra tbsp of yeast (2tbsp +1 tbsp? Hopefully that isn't too confusing! Thanks! Yes, add 3 T of yeast. What kind of mixer are you using? I'm going to use my Bosch. I guess I better make sure it can handle it.. I didn't really think about that! I want to make these for my daughter's wedding. Can they be frozen ahead of time? At what stage would you consider freezing them? This particular recipe doesn't freeze very well. Might I direct you to another recipe for rolls? They actually turn out BEST if the dough is frozen first. Here is a link. The recipe is called Butterflake Frozen Roll Dough, if you can't get the link to work. Good luck! Hands down! The best roll recipe I have tried (and I have tried a lot). Thank you! Thank you! Can these be made the night before and put in the fridge until morning, then pull the pans out and bake? I haven’t ever tried making them the night before and letting them rise in the fridge. Let me know if you try it and how it works out for you. Good luck! I don’t usually comment on recipes, but I had to try this one. I have been trying out recipes for great rolls for many years and even went to a Relief Society meeting where one of the bakers for the Lion House came and demonstrated making these rolls, got the cookbooks and have been trying to make them like he did, but to no avail. I decided to try this recipe of yours and it is perfect! Thank you so much for sharing! I love it when it turns out just as you remember them or as they are pictured. Appreciate your enlightenment here pls. Thanks!! I usually use a Bosch mixer for this recipe. If you are using a Kitchen Aid you would need the dough hook. Just be ware that it makes a large batch, it may be difficult to manage in a kitchen aid that is smaller than a 6 quart size. Good luck! Tried doing this in my kitchen aid mixer. The dough kept crawling up my dough hook and was a real mess. Am I doing something wrong? What size is your Kitchen Aid Mixing bowl? This recipe works best in a 6-7 quart or preferably in a Bosch Mixer. What about a bread maker? I was thinking of trying that to make the dough. Any thoughts? I have ruined every single bread recipe that I have ever tried – this is the very first one that came out perfectly. Thank you for the great recipe and great directions. So excited to make these a staple at my house! can this bread be frozen before they are baked a couple of days before use? Do these rolls have a sweet taste at all? I tried a butterhorn recipe and there was a sweet roll flavor to the baked rolls. I’m wondering if yours is the same or if it’s more of a typical white bread flavor with no noticeable sweetness. Thanks in advance. Love your pesto bread recipe, so good! They do have just a hint of sweetness. You could lower the amount of sugar if you like. Best of luck! Well, thanks for your quick response, I think I want to try this for wrapping my pigs in the blanket. I’m really having a hard time finding a dough I like for those darn things. Anyway, have a good day! I want to make these for 4 people. Could I just make half the recipe? Also think these would be great for wrapping “Pigs in the Blanket” Really enjoy your post and recipes. the bosch xxtrasanitary cycle ?ption of m?ving to anothe? company. If I need about 12 rolls only, can I reduce the recipe by 4 times – all ingredients equally? Or simply put can I half all the ingredients to get half the quantity of rolls? I was wondering if there is any way to cut this recipe in half with out ruining it? My daughter loves this type of rolls as we all do. I would love to make them for her. She uses these rolls for chicken salad. You can certainly cut the recipe in half. The recipe calls for 3 eggs. I have halved the recipe in the past, using 2 eggs and it works out very well. Hope this helps! Hi Jamie, I love your recipes and use your menu plans every week. I’m wondering if there’s a way to freeze the rolls and then let them rise the before baking? Do you know if they will turn out? Trying to plan ahead for Thanksgiving and have less to do the day of. Thanks! Thanks for your question. I would suggest using the following recipe for Butterflake Frozen Roll Dough, it will give you the best results if you are trying to make them ahead of time.